Removals In Spain - Is It Easy To Move House In Spain? Removals in Spain might not be something you want to think about when you have just arrived in the country from the UK. However, at some point you may wish to move house, and change location within Spain. Is that an easy thing to do? How does it work? The best international removers will have bases in the both the UK and their destination country, including Spain. 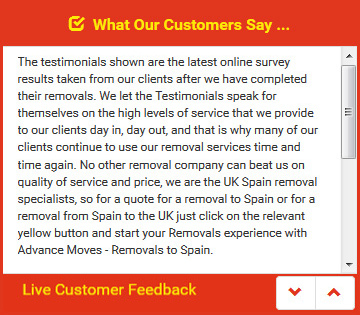 This is great news for clients who are happy with the service the removals firm have provided during the initial Spain removals, since it means they can use the same company again without worry when they want to move to another property within that country. Removals to Spain and across the country can then be carried out by the same firm; and you know who you are dealing with. Moving house in Spain has a number of different costs associated with it, so you must be aware of these before you start looking around. Firstly, there is a tax to pay when moving on the value of the land around the property � it will be a percentage of what it is worth, and this is called plusvalia. You will also most likely to have to pay a mortgage cancellation fee of anything up to one percent of the mortgage value. Not only this, but in order to ensure that the mortgage is cancelled, you will need to engage a notary to sign the correct document; this can cost anything from 600 to 1,000 euros. There are also legal fees and agent fees to pay. Moving house in Spain can be an expensive process, but at least you know that you can find excellent prices for the removal itself with Advance Moves (http://www.advancemoves.com/) and our specialist removals in Spain. We can transport your possessions across Spain as easily as from Spain to the UK. Contact us on 0871 218 0612 or email info@advancemoves.com.